So Annabelle: Creation is a prequel to a movie that was already a prequel for the first Conjuring movie. Normally that would be the kiss of death for a horror film, or any film for that matter, but how does it work here? Let's take a look. I should point out that I'm really not a fan at all of the 2014 Annabelle release and I don't plan on reviewing it anytime soon. All you need to know is that's not scary and it's not interesting at all. Thankfully it's not really required watch this so I'd recommend you avoid it. The story follows couple Samuel and Esther Mullins twelve years on from the tragic death of their young daughter known as Bee. They decide to take in a few girls from an orphanage to fill the silence of their house, but little do they know that the girls arrival will awaken something evil that's been lying dormant for some time. Let's take a look at the characters first as it seems like there's a lot but there's only a couple you need to take note of. Samuel and Esther are played by Anthony LaPaglia and Miranda Otto respectively and while these actors are most likely the best performers, they really don't have much to do here except spout exposition and look slightly creepy. The child actors were surprisingly good, especially Talitha Bateman who played a girl crippled with Polio called Janice and she was easily my favourite character. You really feel for her straight away due to her illness and how she's treated differently by the other girls because she can't keep up with him. The movie does kind of ruin it later on but that's a bit of a spoiler. There's also her friend Linda, played by Lulu Wilson who also gave a good performance in the surprisingly good Ouija 2, who is honestly the only other child character I gave a damn about. There are the two older girls who are honestly just unlikable throughout and I really didn't care what happened to them when the horrors came after them. There are two other girls but I can't remember a single thing they did in the movie and they could have been left out without affecting the overall film at all. There's also Sister Charlotte, played by Stephanie Sigman, who was also pretty forgettable and didn't much of importance until we reached the finale. As for the actual spooky moments, I hated the cheap jumpscares here. It seems like every 'scary' moment during the first 20 minutes is just a fake out of some other character making a loud noise out of nowhere which really annoyed me. Thankfully that didn't last too long as when this film really wanted to ramp up the tension, it could be enough to make you bite your fingernails clean off. 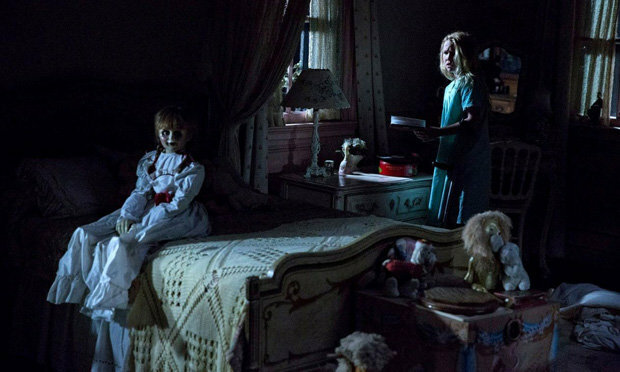 The movie is similar to the Conjuring movies in that it does use loud noises for a lot of it's scary moments, but for the most part they are used very well, mostly to make the doll and the demon possessing her seem even scarier than they already are. No spoilers but if you're like me and have an irrational fear of scarecrows (who the hell doesn't) then you're gonna have a bad time here. There is one scene that's meant to come across as scary but ended up being way more funny than anything as it definitely feels like a rip off or spoof of The Evil Dead complete with the evil being yelling "Your soul". It is pretty ridiculous. The climax itself was pretty disappointing as well as it felt like it was building up to something huge and then the movie just kind of ends and you're left there feeling like you missed a part. Overall I will say that I enjoyed this movie for the most part. The pacing might be slightly off at times and most of the characters aren't that interesting, but the general creepy factor and genuine scares make up for it big time. It'll be one worth watching come next Halloween.